Ramen (ラーメン) is a Japanese noodle dish served in broth. There are many variations of ramen. The broth is often meat based and meat and vegetables are commonly added. I got to try ramen a few times when I vacationed in Japan and I have ordered it from several local Japanese restaurants. Ramen can be very labour intensive to make. You can make your own noodles and you can make your own broth. Or it can also be as simple as adding some boiling water to a cup of instant ramen. 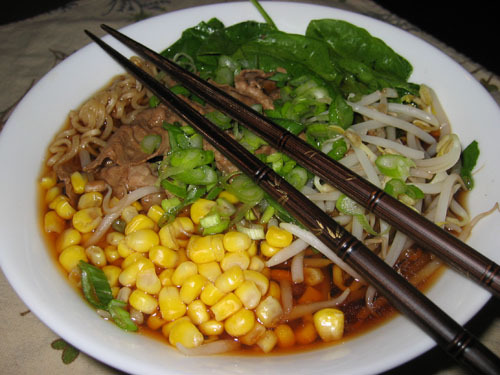 You can make a tasty and healthy ramen at home fairly easily. You can use a store bought stock but it is better to make your own. I almost always make ramen soon after making some fresh stock. I have tried adding soy and sake for a soy based broth and I have tried adding miso for a miso based broth. One good thing about making your own stock is that you probably have some leftover meat to add to the ramen as well. For example, if you made roast beef you could use the bones to make some beef broth and then add slices of leftover roast beef to the ramen. I also tend to throw in whatever vegetables that I have on hand. Some of my favorites are spinach, bean sprouts, corn, shiitake mushrooms, baby bok choy, etc. I like to blanch the vegetables in the stock to add a bit more flavour to the stock. Cook the ramen noodles as directed on the package, drain and place in the serving bowl. Heat the stock, soy and sake in a pan. Blanch the vegetables in the stock one at a time removing them and setting them aside. Add the beef to the broth to warm it (or simmer it until cooked if it was raw). Pour the beef broth over the noodles and add the beef and vegetables. Garnish with green onions and togarashi. I’m drooling!!! Thanks so much for sharing with Presto Pasta Nights. Two this week – way to go! This looks absolutely wonderful. I haven't made this recipe for such a long time I've forgotten how good it tastes. And your recipe is far impressive than what I used to make. Thanks!